The backbone of any great tech conference are the people who participate. This year at the Asia Blockchain Week, there is a lineup of excellent speakers that will take on the issues that surround Blockchain. Bobby Lee, Co-founder of BTCC and Board Member of the Bitcoin Foundation is one of the most well known personalities of the cryptocurrency world and would present his thoughts on stage. Sinhae Lee, Partner at Global Blockchain Innovative Capital, named as Top 10 most influential crypto funds by 36kr (TechCrunch of China) and ODaily (Chinese Blockchain Media) will be present on the stage. Justin Chow, Head of Business Development, Asia at Cumberland is among the speakers as well. Justin is an expert in the evolution of cryptomarkets and cryptotrading. Speakers include Thomas Lee, Managing Partner and Head of Research at Fundstrat Global Advisors LLC. Thomas has worked as a Managing Director with JPMorgan and has a strong equities background. Tone Vays, an ex. Wall Street professional, Crypto & Blockchain Educator, Researcher & Consultant. His passion is ‘separating legitimate projects in crypto/blockchain space from that will most likely fail or are blatant scams.’ Alex Mashinsky, Founder of the Celsius Network, Venture, a founder of over 7 projects with more than 120 Venture Capitalist investments under his belt. He is also the holder of over 50 patents ranging from VOIP, Bandwidth Trading, Click to Call, Discount management on the web and more. He is actually considered the inventor of VOIP technology. David Lee, Professor at Singapore University of Social Sciences (SUSS) and Co-founder of BlockAsset who says his mission is to harness technology for ASEAN connectivity and Financial Inclusion through Singapore as a Smart Nation would also be speaking. Then there is Joseph Young, a contributor to Bitcoin Magazine, Cointelegraph, Forbes and Hacked.com. Zing Yang, Director of the Litecoin Foundation focuses on inspiring change, compassion and joy. Her mission is to build global communities and to harness technology for global connectivity. Michael Gu, Founder of Boxmining who also is a Blockchain expert will be present. Last but not the least among the fine array of speakers is Alex Medana, Co-Founder and CEO of FinFabrik and Board Member of Fintech Association Hong Kong. His focus has been on building next generation of platforms that improve customer journey in capital markets and wealth management. The Asia Blockchain weeks starts with a VIP pre-party followed by the conference itself at Marina Bay Sands. Then the conference focuses on “The Future of the Token Economy” at SUSS. The last day is planned as an Open Day where all blockchain hubs, accelerators and companies in Singapore will open their doors. It will be the perfect opportunity watch blockchain mature in front of your own eyes. As the continent gathers up to witness the premier of the Asia Blockchain Week, should you stay away? 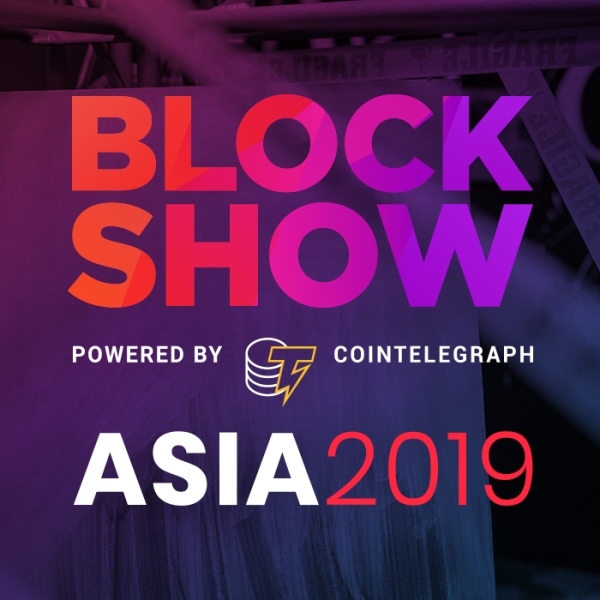 Tickets for the event are already available on the BlockShow Asia website. The future of the Blockchain awaits you in Singapore! Cash as we know it today is completely untraceable. According to the World Economic Forum (WEF), one of the greatest impediments to fighting corruption is cash. WEF states, “Every year, hundreds of billions of dollars of government payments and transfers are made in physical cash. Blockchain world’s best known event BlockShow will come to Asia between November 27 - December 1, 2018 in Singapore at the Asia Blockchain Week. Rub shoulders with Blockchain industry’s who’s who. Tickets are available. Let us create the future NOW! In a world where there is no longer any paper money targeted services like health care would become more efficient as fraud and supply chain losses are cut. Education funding would become easier and more economical as cost of remittances over long distances would fall. Students would be able to keep their degrees and diplomas safely in an electronic format which would be verifiable. People would also begin to notice an improvement in civic services as obtaining licenses, certificates and permissions from local, state and federal government would become faster, simpler and more convenient through blockchain based wallets. Savers and investors would enjoy a trust in the banking and non-banking financial sector as never before. The fact that most cryptocurrencies would not be subject to fiscal indiscipline by central banks would reinforce trust in the economic system and things like hyperinflation and bank runs would only be present in history books. 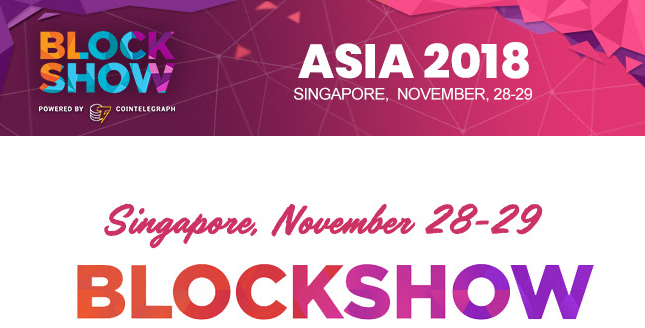 BlockShow Asia 2018, blockchain industry’s most acclaimed conference will be held in Singapore between November 27 - December 1, 2018 as a part of the Asia Blockchain Week. The conference is a splendid chance to network, showcase and learn in the spirit of community.Tickets are now available. "Don’t miss your chance to become a part of one of the most important Blockchain Events 2018! Our close partner BlockShow powered by Cointelegraph is retuning back to Singapore as a part of Asia Blockchain week. The event will gather more than 2000 people (big names from OTC like DRW/Cumberland; funds FBG, GBIC, Signum, Fenbushi as well as Regulators and Corporate representatives) the second year in a row on November 28-29, Marina Bay Sands. Hurry up! The prices will increase on November 15!" As we approach the end of a crucial year for blockchain, the number of questions which have come to surface continues to grow each week. In a landmark event which draws the year to a close, BlockShow’s Asia Blockchain Week will amass business leaders from across FinTech to reach a new consensus about where exactly it is headed. This event, which takes place at Marina Bay Sands Expo and Convention Center in Singapore from the 27th November to the 1st December, will stand out as one of the most significant blockchain conferences ever to take place, covering every aspect of the technology and its applications from grass-roots through to international government. There is something for everyone at Asia Blockchain Week and it’s due to be one of the largest events ever to take place in the sector. Following the two days of BlockShow, Singapore University of Social Sciences (SUSS) and Singapore Academy of Law raise debates about smart contracts and ICO listings and their regulation, trust distribution, and regulations on the convergence of technology. This will no doubt set the bar for governmental cooperation in the field - act fast, as there are limited places! Our partners LongHash also host a day-long event to close the Asia Blockchain Week, giving conference-goers the chance to hold their final meetings while taking note as to what real blockchain use cases in action look like. From a single conference which took place in 2016, BlockShow now hosts multiple events each year. It has a history of targeting the main centers of innovation across the world, setting up specialized conferences in the dominant technology hubs of America, Europe and Asia. 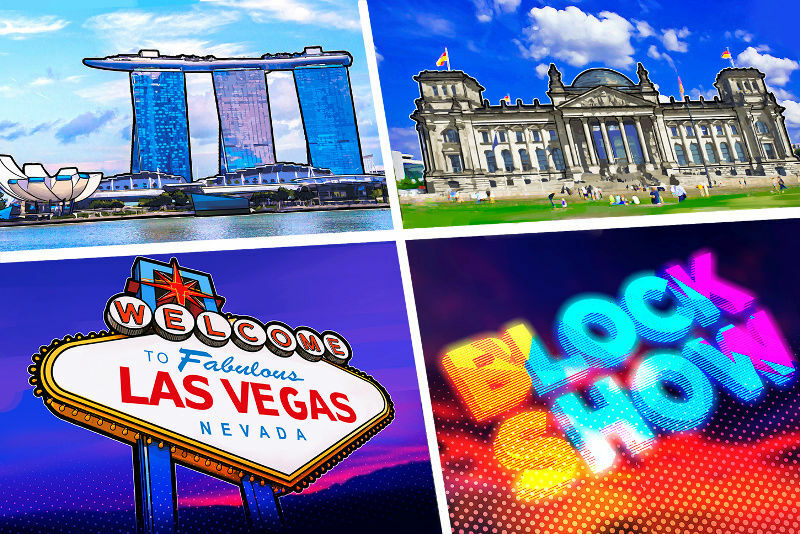 This year has already seen thousands of blockchain investors, engineers, enthusiasts and entrepreneurs attend the European BlockShow in Berlin, Germany and the Americas BlockShow, which took place in Las Vegas, USA. Consistently attracting interest from global figures such as Wikipedia’s founder, Jimmy Wales, President Obama’s Director of Press Advance, Johanna Maska, and Techcrunch’s Editor-at-Large, Mike Butcher, BlockShow bridges the gap between blockchain and the wider world. The Asia Blockchain Week will see the greatest number of attendees of any BlockShow so far, creating a discourse among many thousands of people over the future of this revolutionary technology. The reality of blockchain conferences is that it is a merger of abstract technology with social interaction. It is important to separate the Blocks from the Show, addressing each half individually before congregating together to reach a consensus that evaluates both in the real world environment that it must operate in. BlockShow caters to this model. With in-depth talks about tech-heavy topics such as the integration of blockchain and AI, or addressing the political nuances of governments taking over blockchain, it is necessary to take the time to congregate in the lounge to break these topics down to a personal discussion, one which unites our human qualities with high-level abstractions. For when the technicalities become too much to handle, attendees can visit the on-site art gallery, to see some of the world’s most talked-about crypto-art, including the $6 million CryptoMother, signed by Buterin himself. As the final event of 2018, this conference will be unlike any other. Not only will it bring representation from some of the biggest names across cryptocurrency and business, partnering with flagship organizations such as Coinmarketcap, LongHash, Treecoin, Mithril, Connectome, Quanta, Vbit, SFA, Access, Blockchain I, Whale Block and many other, but it will also be an opportunity to hear from world-renowned speakers such as Bobby Lee, Tone Vays, Mark Mueller-Eberstein, Prof. David Lee, Dr. Ben Goertzel, Ted Lin, Jason Hsu, Michael Gu, Thomas Lee, Justin Chow, Jehan Chu, Martin Lim, and over 60 more from the diverse world of organizations, companies, politicians, investors and thought-leaders. In a world-first, this fall’s show will include a live-streamed segment, EXP20, which offers viewers a transparent look into the reality of startup pitches, bringing ten hopeful companies in front of a panel of investors, to convince senior venture capitalists that their idea is worth investing in. To make it all the more nerve-wracking, BlockShow attendees will be able to watch it all unfold in person, on the venue’s second stage. There has been a tendency for blockchain conferences to edge away from technology and instead focus on ostentatiousness. Blockchain is not about being showy, or hiring Lamborghinis to entice people into a ‘get rich quick!’ scheme. This not only creates a rift in the community but sends a message of frivolity to the wider world. It is essential that such events place the technology front and center, inviting professionals and politicians to debate its very real significance at every level of application. That’s why BlockShow balances representation from both sides: the chaos of entrepreneurship and the much slower approach of lawmakers, with plenty of representation also coming from the middle ground. Startups wishing to take their idea to the next level need look no further than BlockShow Asia. Not only does the event offer discounted rates for company delegates, but there is further incentive for those who wish to set up a booth and directly target investors throughout the event in the main exhibition hall. With over a dozen prominent VC funds in attendance, it could be the perfect opportunity to attract the next financial boost and receive valuable guidance along the way. Some of the funds in attendance include JRR Crypto, Sora Ventures, BCI Fund, Blockchain I, LuneX Ventures, TRIVE, DYOR Capital, Rock Expansion, Plutusvc, Zenith Ventures, ZEOS Capital, Blockchain Founders Fund, Huobi Lab, QCP Capital, Fenbushi Capital and GBIC. While it’s important to emphasize that blockchain is serious tech, there will be plenty of opportunities to leave the business behind and let loose on the dancefloor. Meanwhile, there will be startup soirées, get-togethers and impromptu celebrations taking place throughout the iconic Marina Bay Sands venue and in the surrounding area. This will be an opportunity to forge more personal relationships among attendees and to rub shoulders with the people who stand at the forefront of this new technological movement. If you haven’t got your tickets yet, time is running out. With the event of the year taking place in just a matter of days, this is the last opportunity to be at 2018’s most important blockchain showcase. 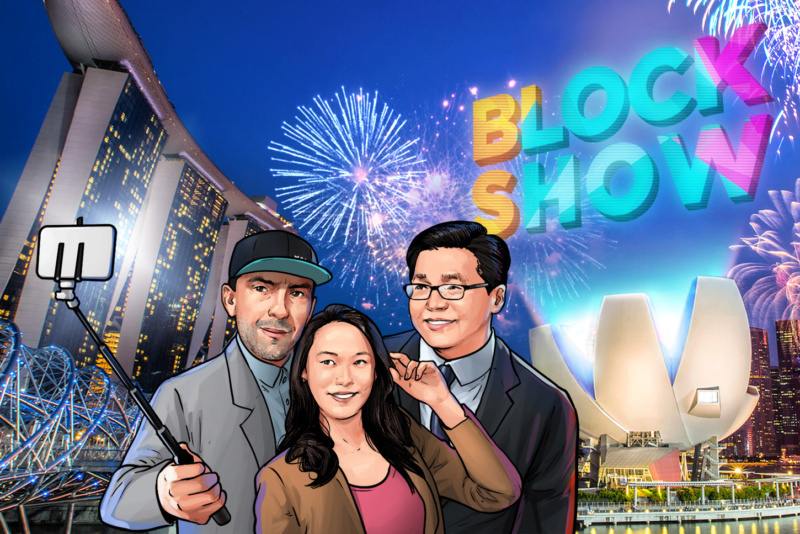 Bringing an international audience of 2800 people to Singapore, BlockShow Asia 2018 was the pinnacle of a year full of excitement, news coverage and heated debate. With around one hundred speakers, the conference came to a close in high spirits. In the wake of dramatic swings in the cryptocurrency market, which saw Bitcoin’s price tumble to a low of under $3700, the event, in partnership with Cointelegraph, was steadfast in focusing on how blockchain is maturing into something that affects our everyday lives. With a strong FinTech and political presence, it also introduced the many other worlds where blockchain’s seeds are starting to sprout - art, security, advertising, gaming, music, infrastructure, and more. As the third and largest event of an unpredictable year, the huge success of this BlockShow has reinforced the importance of the global movement that has brought blockchain to prominence. It also saw the first ever example of conference tickets purchased through smart contract, a landmark in adoption, “I saw it worked out cheaper to purchase, I could do it easily through Metamask and I like the idea a lot because it provides some additional features, like privacy, or the ability to transfer to other people - these are things I hadn’t even considered before.” This came from Matt, a blockchain developer who purchased the very first ticket using Ethereum. While uncertainty is still rife when considering Asia’s crypto sentiment, leading experts gathered in a panel to discuss the mark that these restrictions have left on the economy as a whole. Furthermore, a later panel explored the potential for blockchain to ‘bring the Asian Tigers back’ - for economies such as Taiwan, Hong Kong, South Korea and, of course, Singapore, crypto-optimism could pave the way to a new boom in their productivity and wealth. With a panel including Thomas Lee, co-founder of Fundstrat; Sinhae Lee, Founding Partner at GBIC and Block72 International Blockchain Consulting; Jason Fang, Managing Partner at Sora Ventures, Founder & CEO at Sora Foundation; Chia Hock Lai, President of Singapore FinTech Association (SFA), Chairman of Token Economy Association and Zing Yang, who sits on the Board of Directors at the Litecoin foundation, the debate was fueled by a certainty that, if blockchain is to thrive, it will be these economies that enable it to reach the next level of widespread adoption. Without drawing too much from the day’s agenda, some notable panel members included Mastura Ishak, Programme Director for Blockchain at the Malaysian Industry-Government Group For High Technology (MIGHT), who implored the audience to reach out by stating “I can say that Blockchain has a lot of potential in Malaysia”; Aunchisa Tapanakornvut, Senior Officer, FinTech Department at Securities and Exchange Commission of Thailand; Le Ngoc Guang, Ministry of Justice of Vietnam and Josephine Romero - the Philippines’ Presidential Advisor for Entrepreneurship and Advisor to the Chair of ASEAN-BAC. Having representation from political groups has always been a central concern of BlockShow. As governments grow more interested, for one reason or another, in blockchain technology, it is the part of the people to ensure it remains open and is not used as a tool of manipulation or oppression. This well-attended panel showed that there is a lot to do before governments will begin to reap the benefits of the technology but the movement is beginning to become more well-rooted and practical applications are being explored at every level, though this is true in some countries more than others. As an overview, representatives from across Asia each showed that governments can play a supportive role, with Taiwanese legislator, Jason Hsu, stating “we wanted to make sure that our population can easily use bitcoin in their everyday life - to buy regular products, oil and so on We wanted to make it a lifestyle.” From India came a similar statement, “we have to use blockchain in our modern life, especially in factories and logistics.” Romero followed up to voice the Phillippine’s current outlook, “Agriculture has to use blockchain, while the second sector is tourism, and the third is finance.” It is clear that governments can act both harmoniously and maliciously in their use of blockchain, with Bobby Lee pointing out that “Governments worldwide will do more & more to suppress Bitcoin,” but, in Asia, it seems that the politics are leaning in favor of putting it to good use. While the BlockShow Oscars used to stand out as one of BlockShow’s biggest attractions, this year saw the launch of a new unique segment, EXP20. Streamed live from the conference, it saw 16 startups bring their blockchain-based businesses in front of a panel of venture capitalists, including JRR Crypto, Sora Ventures, TRIVE, BCI Fund, Blockchain I, Lune X Ventures, Trive, DYOR Capital, Plutus VC, Zenith Ventures, ZEOS Capital, Blockchain Founders Fund, HUOBI Lab,Fenbushi Capital. The aim was simple - pitch your business idea in five minutes, and hope it stands the scrutiny of some of the sector’s leading experts. Winning meant the support, connections and financial backing to bring the business to a global stage, but losing left the teams with nothing. Unlike the BlockShow Oscars, this model gave each startup the chance to win, regardless of how the others fared. Ultimately, it was HealthDex (an enterprise health data marketplace) and Diro, a platform to verify and share documents, which walked away with the financial backing and expertise from Blockchain Founders Fund, bringing them support that will no doubt soon propel them into the top tier of blockchain startups alongside the likes of Monero, IOTA, Dash and NEO. Singapore clearly stands at the forefront of blockchain innovation, and we’re sure all of our attendees will be returning home with a new outlook. The world needs blockchain more than it realizes, and without technological havens such as Singapore, we may never see the culmination of just what amazing things are possible. It’s incredibly sad to see everyone leave after living in the glow of one of the most fantastic conferences we’ve had the pleasure of attending - and that’s conferences, period, not just those discussing blockchain. BlockShow will, of course, be returning in 2019, and we’ve no doubt the landscape will look radically different once again. Until then, keep an eye out for announcements and keep working on building a better world with blockchain. The Pre-registration to BLOCKSHOW ASIA 2019 is open! Hurry Up! Our special offer is valid till March 7. As blockchain technology celebrates its tenth year, it is clear the ecosystem has evolved significantly. Nefarious activity has long tarnished the sector, from those who favored bitcoin’s anonymity in illicit online marketplaces through to high-profile thefts from exchanges. What we began to see in recent years, however, is a new, pragmatic approach to these issues, one which reveals a more mature environment ready to engage with malicious actors as a matter of course. There is a sentiment that 2018 was an underwhelming year for the market but it was, in many ways, also the most dramatic. Almost $1.7 billion was stolen through exchange hacks and scams alone. These figures, released by analytics firm CipherTrace, show a staggering increase from 2017 - exchange thefts increased by 300%, while there was an astounding 1,200% rise in exit scams and other ICO shams. Despite an overwhelming uptake of KYC and AML procedures over recent years, it has clearly had little effect on curbing the appetite of thieves and scammers. This has led to the creation of analytics tools, such as Crystal, which are able to trace misappropriated funds and help take measures against the users of the wallet. While the victims of these criminals will likely not agree, there has been a positive side to this increased threat. Not only does it reinforce the message that assets be stored locally, as opposed to an exchange, and that potential investors do their due diligence before investing in an ICO which makes unrealistic promises, but it has accelerated the progress of services which act to prevent, discourage and hold accountable those who would seek to continue pursuing criminal activity in this sector. As we see this stride towards a self-managed ecosystem that develops its own tools for reactive security, it is most clearly shown in the large-scale public events where experts gather to discuss the more pressing issues of the moment. Blockshow, among the largest of such conferences, was quick to enlist Crystal to provide its risk-assessment technology for all attendees, marking a new stage in efforts to purge the blockchain ecosystem of would-be criminals. 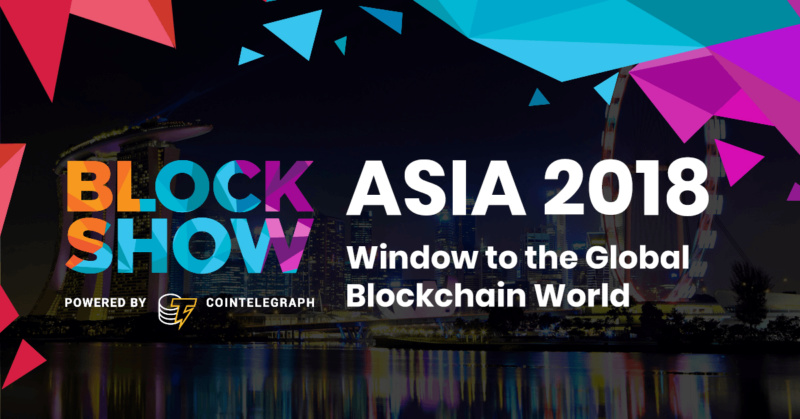 At its 2018 Asia conference, Blockshow supplied every attendee with an innovative Blockchain analysis tool, Crystal. As part of a move to nurture greater security and accountability in the blockchain sphere, Crystal, developed by Blockfury, provides risk-scoring of cryptocurrency wallet addresses, allowing vendors and investors alike to easily identify an individual or company closely associated with malicious activity such as exchange hacking or exit scams. In January, a major theft from Cryptopia exchange saw a demonstration of new security countermeasures unfold as Binance froze a portion of the stolen funds before they could be sold off. Introducing new techniques for tracking criminal activity promises a much more resilient and attractive environment for investors. One aspect where Crystal shows real promise, however, is in face-to-face interactions. 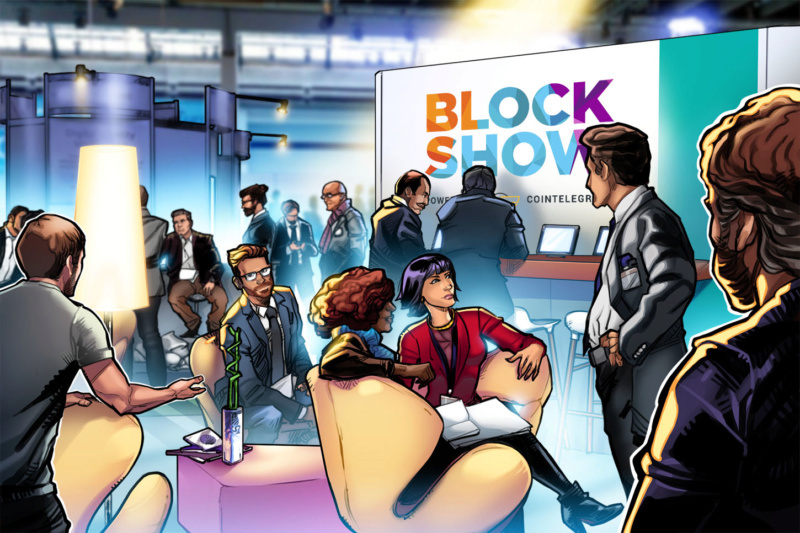 One of the most effective ways to connect with potential investors is to draw them in for face-to-face discussions and conferences like Blockshow offer the perfect environment to do so, attracting all kinds of funds on the lookout for the next big thing. Every fifth company to showcase their product to Blockshow walks away with a deal, bringing a much-needed sense of financial security in these uncertain times. These interactions between companies and investors rely on many things, but trust is arguably the most important. With over a billion dollars raised so far, conferences play a major part in fundraising strategies. Introducing a risk assessment to these meetings brings a verifiable means to quickly quantify the trustworthiness of the individual or group, and could serve as a catalyst to the process. As the market begins to stabilize once more, the conferences of 2019 are anticipated to offer a host of new, exciting ventures. 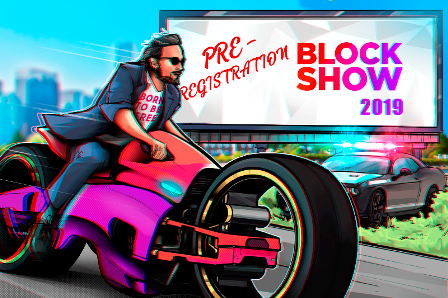 Pre-registration for Blockshow Asia 2019 is currently open and an announcement about its latest initiative will be unveiled on March 7. Among Top Speakers Antony Lewis, Director of Research at R3, Author of "The Basics of Bitcoins and Blockchains"; Czhang Lin, Partner at JRR Crypto, Advisor for Asian Isreal Blockchain Association; Justin Chow, Head of Business Development, Asia for Cumberland, the cryptoasset arm of DRW; Jehan Chu, Co-Founder & Managing Partner at Kenetic, Co-Founder Social Alpha Foundation (SAF); Remington Ong, Partner at Fenbushi Capital, managed investments into 40+ leading global startups; Llew Claasen, Executive Director at Bitcoin Foundation, Managing Partner at Newtown Partners; Mike Kayamori, Co-Founder and CEO of QUOINE; David Lee, Professor at Singapore University of Social Sciences (SUSS), Director at LeftCoast, Co-Founder at BlockAsset Ventures, Libai.io; Eddy Travia, Co-founder & CEO of Coinsilium, 'Most Influential Investors of the Year' at Blockchain Awards 2014; Joseph Young, Financial analyst & Investor,the Contributed to Forbes, CCN, Cointelegraph; Ted Lin, Chief Growth Officer at Binance and many others. The world is united in mourning the damage caused to Notre-Dame cathedral in Paris, France. In the face of such a tragedy, it is important to look to the future and work to restore the cathedral to its former glory. 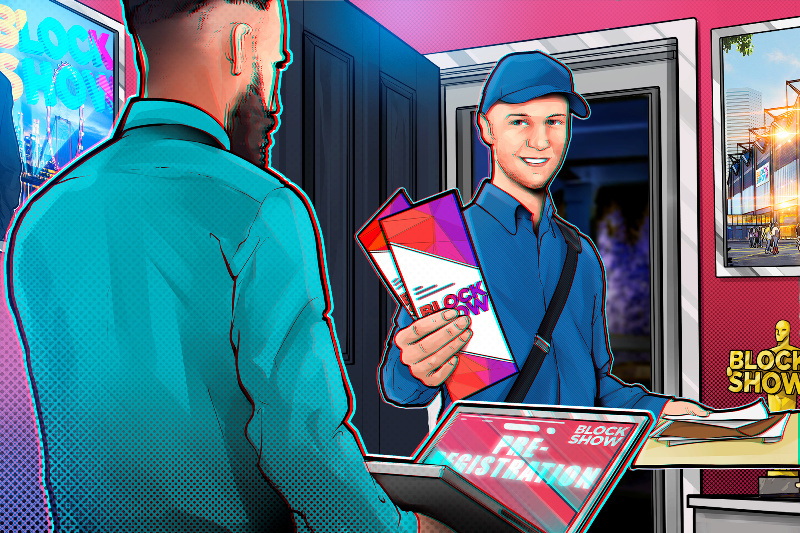 Therefore, organizers of one of the world’s largest blockchain conferences, BlockShow, have launched a donation program to support restoration efforts. 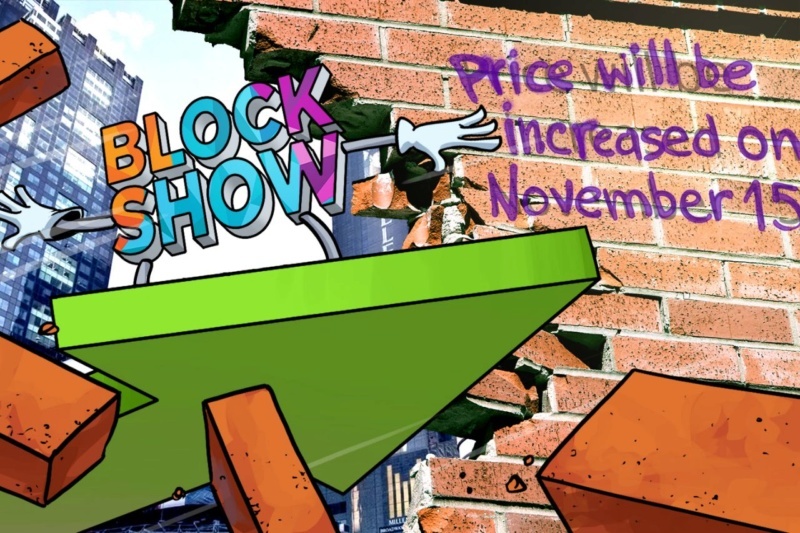 To encourage people to donate, BlockShow has offered free tickets to BlockShow Asia 2019, taking place in Singapore this November, to anyone whose name appears on the official donation list or who contributes to Bitcoin, Ethereum or Bitcoin Cash addresses set up specifically for this cause. These addresses were published directly to BlockShow’s Twitter account and, thanks to blockchain technology, offer full transparency to ensure the money goes directly to the restoration fund. Once you have donated, send a screenshot of your transaction to hi@blockshow.com to receive your ticket.